“It seems lately everyone wants to beat me up,” fictitious, never-say-die heavyweight warrior Rocky Balboa. Red-hot British heavyweight contender Daniel Dubois, 9-0(8), put it out this week how he would “relish a fight with Dereck Chisora.” And of course it’s nothing new in boxing when we witness the sad spectacle of a young stud battering an ageing fighter in a “test” of a fight. But this possibility of a match-up positively reeks of bad news – for the likeable Chisora in particular. Chisora, who has lost nine of his pro fights, is going to carry on plying his trade, but a fight with the hard-hitting, hugely ambitious and determined Dubois, a man some 14 years the younger man, is one “Del Boy,” or “War” should swerve. In terms of his recent form, Chisora has managed just one meaningful win: this against fellow veteran Carlos Takam, in a fight that Chisora was losing and taking heavy shots in before sensationally turning things around. Against the younger, bigger, faster, harder hitting Dubois, Chisora would find it much, much harder to turn things around. Sure, the promotional hype accompanying this fight (if it gets made) will inform us how the bout will test Dubois, that it will show us how good he really is, that Chisora will use all of his toughness and experience to make it a great fight. Blah. We can see through such blurb and we know that if this fight took place Chisora, more hittable, less durable and less able to launch an amazing comeback than ever before, would take a nasty beating. 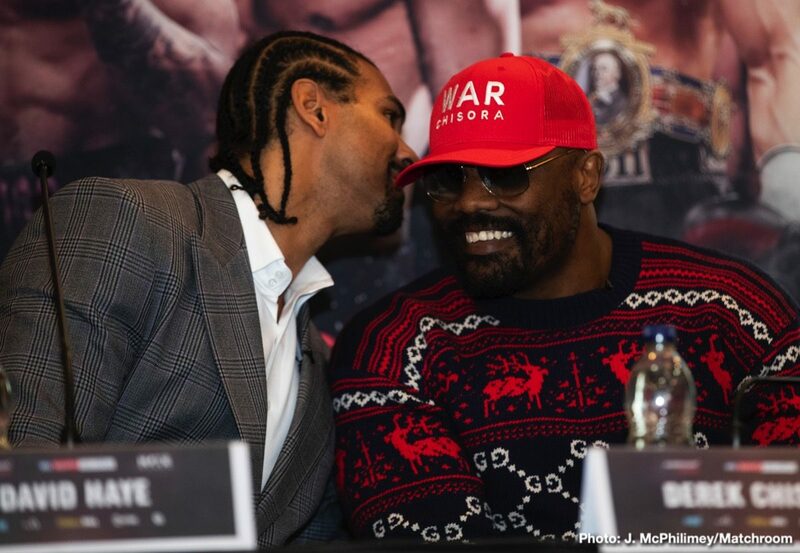 Chisora deserves better, and so do the paying fans. If Chisora must fight on, he should be matched with guys closer to himself in terms of age and wear and tear endured (a return with Takam makes better sense), and if Dubois wants to learn his trade in tough fights, he should be matched with other young guys like Nathan Gorman and Efe Ajagba or maybe Joe Joyce. Bottom line: when you know the result of a fight before the first bell rings, it’s not a fight worth watching, or paying for. And we know the ageing, past his best but still brave (too brave) Chisora would get hammered by a rampaging Dubois; a fighter many see as a star of the future. To some extent all fighters who have the raw courage needed to step into the ring in the first place are exploited, but this would-be fight would result in far worse than mere exploitation. One man could end up badly hurt. Let’s pass on this match-up, shall we.